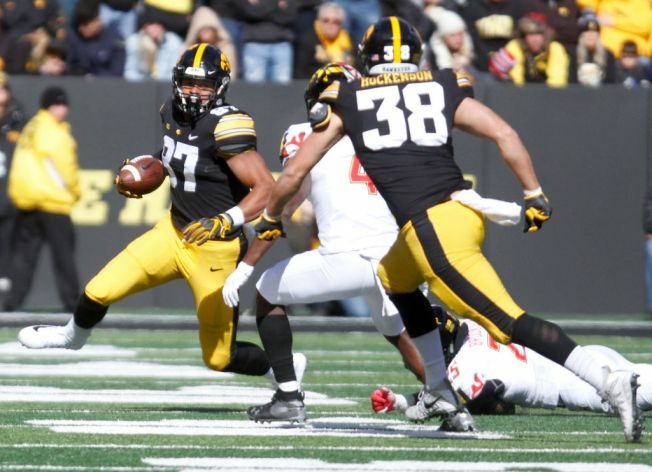 At Iowa this past season, Noah Fant played a supporting role at tight end to T.J. Hockenson. Both players were a big part of the Hawkeyes’ offense, but Hockenson had the starring role. Hockenson caught 49 passes for 760 yards and six touchdowns, while Fant had 39 catches for 519 yards and seven scores. Then, at the NFL combine in February, Hockenson showed off his speed and athletic ability and his stock soared, making him a possible top-10 or top-15 pick. Fant, meanwhile, also is highly regarded and could also go in the first round – and could be a target of the Raiders with the 24th or 27th pick, if he lasts that long. Fant, in fact, is scheduled to meet with the Raiders Monday in a pre-draft visit, reports Ian Rapoport of NFL.com. With last year’s No. 1 tight end Jared Cook now gone as a free agent, the Raiders have a need for a pass-catching receiver at the position, and Fant could be just what the team is looking for. Iowa has a history of producing NFL-quality receivers – such as George Kittle across the Bay with the 49ers – and Fant, like Kittle, could prosper as a pro. Fant is 6-foot-4 and 249 pounds and has the speed to create problems with opposing secondaries. NFL draft analyst Lance Zierlein sees Fant as a potential star, calling him a "pass-catching tight end with the length, acceleration and speed to create matchup challenges both short and long." Zierlein says Fant is a "coveted prize" for teams "ready to add a move tight end as their new matchup toy." Fant came to Iowa billed mostly as a receiver, but improved his weight and strength to become a better blocker, too. Now, some believe Fant could be a high-impact player and a mid to low first-round choice. If he’s still there at 24 or 27, the Raiders might find themselves a young gem. Kyle Crabbs of The Draft Network calls Fant possibly "the next big thing at the (tight end) position in the NFL." Wrote Crabbs: "Fant runs like a receiver and leaps like a basketball pro. Fant is a nightmare in space and will excel in a vertical passing offense that can implement him in the middle of the field." The Raiders have a need at the position. Fant would fill it.